Before her marriage to Prince Leopold of Saxe-Coburg-Saalfeld, Princess Charlotte of Wales, the heiress to the British throne was betrothed to Prince William, the Hereditary Prince Of Orange. That was an union the Princess, much to her father’s chagrin, had never been too keen on. Both her mother’s hatred for the Orange family, and her reluctance to leave England and live abroad, even for a few months a year, eventually prompted her to end the engagement. 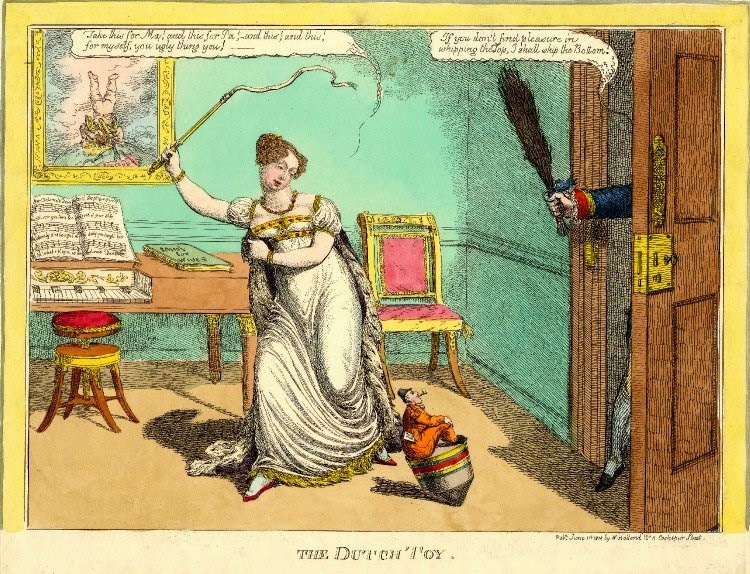 Sitting under a canopy, Princess Charlotte is pulling the strings on a jointed puppet representing the Prince of Orange in military dress, holding a flag inscribed “Orange Boven”. Across her knees rests a miniature portrait of a man, inscribed “Fitz Mo” (the rest of the name is illegible). At her feet lies an open book inscribed “Clarence’s Dream”. 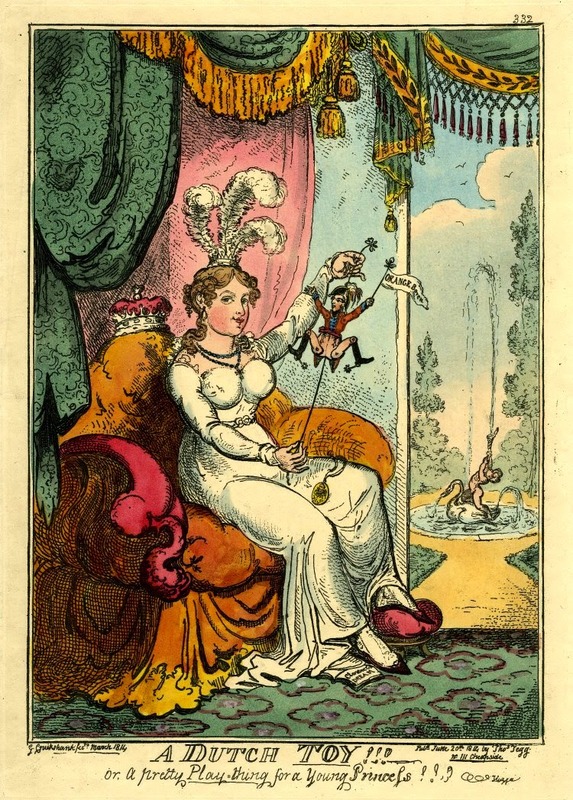 In the garden, we can see a fountain, with water spurting from a cupid seated on a swan. Is Charlotte serious about the Prince of Orange, or is she just toying with him? On the wall, hangs a portrait of Cupid. He’s standing on his head on a terrestrial globe, in the country of Holland, aiming his arrows at England. 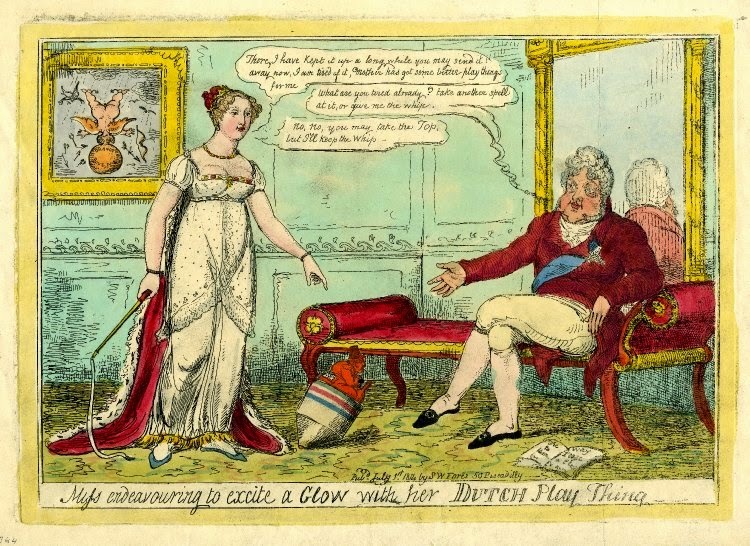 Printed one month after the previous print, Miss Endeavouring to excite a glow with her Dutch Play thing depicts Charlotte, still with a whip in her hand, standing over and pointing at the “Dutch Toy”, who is falling forward. The Prince of Orange is still smoking and carrying the contract in his pocket, but he’s now resigned he’s never going to marry Charlotte. Between his knees, he holds a bottle. At the Regent’s feet lies an open book titled The Way to Teaze him a Play in V acts’. On the wall hangs another portrait of Cupid. This time the god of love, who has dropped his bow and broken arrows, is resting his head on a large orange inscribed “Orange Boven”. What do you think of these prints?